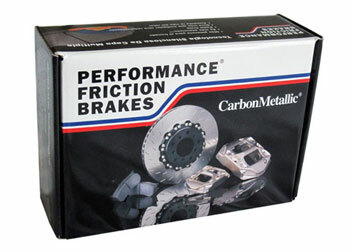 Performance Friction Brakes Carbon Metallic® race pads win more championships & are used by more professional racers than all other pads combined. Performance Friction delivers BETTER CAR PERFORMANCE THROUGH OPTIMAL TIRE UTILIZATION by improving the individual performance of the elements that influence the entire braking system. More consistent pedal, smoother release & more predictable. Z Rated Compound - An excellent high performance street brake pad compound. Offers improved stopping power while maintaining low noise, low wear rate & low dust levels. 01 COMPOUND - 01 is one of the most popular racing compounds in the PFC's arsenal. At the end of the stop, 01 compound has less torque scatter for improved modulation with excellent release & a flat torque curve. 01 compound is very easy on the discs with very low wear. 06 COMPOUND -06 compound pads are very similar to PFC 01 for both bite & torque. Excellent release & control with very low wear. Very low abraded disc wear with a "powdery type" transfer layer. 06 pads are an excellent alternative to other brands of endurance compounds but with much higher performance. 08 COMPOUND - Characteristics include smooth initial bite with a slight friction rise with heat, excellent release & modulation characteristics, & very low abraded disc wear. In addition to its considerable performance, 08 wears the longest of all PFC pads & easily matches wear of the other competitors while offering much higher bite.